How do you like your cranberry sauce? I’m hoping the answer is rich and thick, luscious but not smooth, tart and mildly sweetened, with a hint of citrus and a lightly herbal finish. ‘Cause that’s what I made. In actual fact, this cranberry sauce was a complete accident of a recipe. I wanted to photograph the Swedish Meatballs and the Whipped Sweet Potatoes from my cookbook and I usually serve those two things together with the Cherry Thyme Sauce that’s in there, too. I thought I had some frozen cherries still stashed in my freezer… but it turned out, I did not. And while I still haven’t figured out when or how I used those imaginary berries, I managed to salvage my little photoshoot by making a sauce from the bountiful freezer draw that will apparently be stuffed full of cranberries until sometime in January. Why was I photographing cookbook recipes again, you might ask? Well, the original hardcover edition of Nourish: The Paleo Healing Cookbook got a little update, a new cover and a paperback edition that is going to be out in the world soon! Just after Thanksgiving, you’ll see it in bookstores (and Costco!) 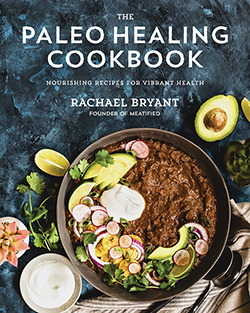 as the slightly abbreviated title The Paleo Healing Cookbook. People have been asking for a paperback version of the cookbook for aaaaaaages now, so I’m really excited to make one available! It hits stores Tuesday, November 28th! When I wrote the recipes that would go into and become The Paleo Healing Cookbook, they were developed for the oven or slow cooker. Since then, I – along with so many other people! – have come to use and love the Instant Pot, an electric pressure cooker that cuts down on cooking time dramatically and makes things a little simpler and quicker in the kitchen. 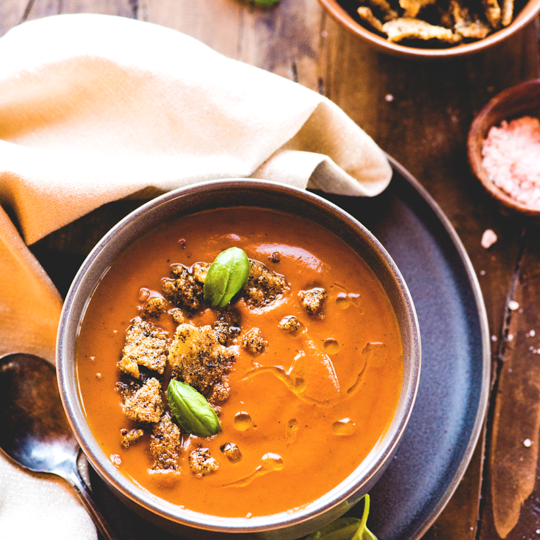 Since I always want to create recipes that are delicious, nourishing and as usable as possible, I’ve gone and converted 35 of the recipes in The Paleo Healing Cookbook so that they’re totally Instant Pot friendly. You’ll save a little time, but not lose out on any flavor. Both the Swedish Meatballs and the Whipped Sweet Potatoes you see here were made using these newly converted Instant Pot recipes! As a “thank you” to everyone of you who has supported me over the years either by purchasing the hardcover Nourish or by pre ordering The Paleo Healing Cookbook, I wanted to add a little something extra to the paperback, but we didn’t have any extra pages to spare. Instead, I’ve put all of those converted Instant Pot recipes into a completely FREE companion ebook that works in tandem with either form of my cookbook. You can grab your own copy here. ANYWAY! Let’s get back to the cranberry sauce at hand! I’ve made this Cranberry Sauce just as I like it: thick and chunky, not overly sweet, with a smidge of seasonal citrus and a little herbal surprise from some rosemary. I don’t know about you, but I get a little cinnamon-and-cloves-in-all-the-things at this time of year and the rosemary goes so very well with the orange in this recipe. You can use whichever kind of oranges you have to hand. I had some beautiful blood oranges, so I used their juice and zest. Whatever oranges you use, make sure to grate a good teaspoon or so of orange zest right into the saucepan as it simmers! The balsamic vinegar is totally optional, but I love the complexity it brings to the cranberry sauce. At first, I was a little hesitant to add a vinegar to a condiment that is already on the super-tart side of flavor town, but the lovely, syrup-y goodness brings a mellow zing and a subtle sweetness that means you don’t have to add a bunch more honey or sweetener. It’s also a lovely complement to the pine-y punch that comes from the fragrant rosemary. If you like a cleaner, fresher flavor that still has some of the traditional balsamic’s depth, I’d recommend subbing in white balsamic vinegar if you happen to keep it stocked in your pantry. Other vinegars lack the depth that the balsamic brings to this cranberry sauce. See how luscious and thick this cranberry sauce is, without needing to add any kind of thickener or gelling agent? That’s due in part to the applesauce I include in this recipe. It doesn’t come through, flavor wise, but it provides the perfect background for the cranberries to break down into a chunky cranberry sauce without the gloop. I like to only partially smash the cranberries down with a potato masher, leaving behind plenty of whole berries for texture and that great pop when you bite into them. Here, I’ve paired the cranberry sauce with Swedish Meatballs and Whipped Sweet Potatoes, but it would be the perfect addition to your Thanksgiving table, served with weeknight chicken or even swirled into coconut yogurt for breakfast. Don’t forget to pick up your FREE Instant Pot companion ebook if you own Nourish or have pre ordered your copy of my paperback, The Paleo Healing Cookbook! COMBINE: Add all of the ingredients to a saucepan over medium heat. Cook, stirring occasionally, until the cranberries start to break down and the sauce starts to thicken and come together, about 5 minutes. SMASH: Use a potato masher to gently press down on the warm cranberry mixture so that some of the cranberries are lightly crushed. (I like to leave quite a few whole cranberries, but you can mash them as mush or as little as you like!). Continue warming the cranberry sauce, stirring often, until it thickens and you can pull a spatula through the mixture cleanly, about 10 minutes. Remove from the heat. SERVE: Remove and discard the rosemary sprig. The cranberry sauce can be served warm or room temperature, as you like. It will keep nicely in the fridge, in an airtight container, for a week or so and is even better once it’s been set aside at least overnight so that the flavors can mingle together. The cranberry sauce can be frozen for up to 3 months in an airtight container. Any orange will do, but blood oranges are so seasonal and lovely I couldn’t resist them. Sub in whatever oranges you have to hand and add at least a good generous teaspoon of orange zest. Traditional balsamic vinegar gives a sweeter, more dominant flavor than its white balsamic vinegar counterpart. For a slightly milder and less obvious flavor, pick the white variety. Funny! I bought cranberries over the weekend and though,t “Rachel will have something different and wonderful for me to make”. You posted just in time. Thanks! Hi Rachael….I have cranberries in my freezer (I’m sure of it) but I don’t need cranberry sauce until Christmas. If I make this now, will it last in the freezer until Christmas? Thanks! I LOVE your blog. Yes, absolutely! You could also just make the sauce closer to the time using frozen cranberries, since they thaw in no time on the stovetop with all the other goodies. Totally up to you!